PZ Cussons is a favourite among defensive and income-focused investors, and with good reason. It has, for example, raised its dividend for 42 consecutive years, which puts it firmly into “dividend aristocrat” territory. The company has achieved this primarily by selling small ticket repeat purchase items with strong brands and market leading positions, such as soap (Imperial Leather), olive oil (Minerva) and washing up liquid (Morning Fresh). These high margin and frequently purchased items give the company a steady and defensive cash income. At the same time its exposure to emerging markets and willingness to make carefully chosen bolt-on acquisitions have allowed it to grow faster than most other companies. The chart below shows PZ Cussons steady progress over the last few years, as well as its resilience through the financial crisis of 2008/9. In recent years reported revenues have been a little flat and normalised earnings per share have wiggled, but that should not come as a total surprise given the relatively tough economic environment, especially in emerging markets. Measured against the large-cap market average (PZ Cussons is in the FTSE 250, but for the sake of simplicity I compare all stocks against the FTSE All-Share or FTSE 100) this company clearly has an above average track record. As long as the debt ratio is below 5, the pension ratio below 10 and the debt and pension ratio also below 10, then I’m normally happy. PZ Cussons currently has middling levels of financial obligations and so that’s good enough for me. I’ve written about those various debt rules before and – if you want – you can calculate all of the metrics mentioned so far with these spreadsheets. One point to note here is that debt levels have been increasing quite quickly in recent years as the company has been acquiring other companies with borrowed money. While this is okay, I wouldn’t want to see its debt levels go much higher as the risks of borrowed money increase exponentially. Speaking of acquisitions, they are another potential risk (whether funded by debt or not) if they are too large, too frequent or too unrelated to the acquirer’s core business. In PZ Cussons’ case, there have been several sizeable acquisitions recently, although only one crossed into my definition of “large”, i.e. cost more than an entire year’s profit. That large acquisition came in 2008 with the acquisition of The Sanctuary – a spa and related beauty products – for £75m at a time when PZ Cussons’ post-tax profits were just £39m. The Sanctuary’s beauty product business is closely related to PZ Cussons’ personal care products, and so the fit appears to have been good. This large acquisition does not appear to have caused any disruption to the core business. There were other major acquisitions in 2011, 2014 and 2015, but these were also closely related to the core business and also appear to have gone relatively smoothly, at least so far. If a company has a strong track record then my final step is to look for what problems it is either facing today, or could face in the future. After reading through the company’s most recent annual report and other recent announcements and news, it seems to be business as usual. There are no obvious major problems at the moment, although it would be fair to say that the current economic environment is “challenging”. I also couldn’t think of any obvious reason why there would be major problems in the future, unless someone works out how to disrupt the soap industry. And so on that basis, with PZ Cussons appearing to be a solid company with an enviable track record and no obvious impending disasters headed its way, I would be happy to invest in this highly successful business at the right price. What is the right share price for PZ Cussons? At 270p PZ Cussons is not an obvious value investment. Its PE10 and PD10 ratios are higher than the market average, while its dividend yield is lower. However, it does have a track record of above average growth and consistency, and so it is quite reasonable for it to command a premium price. After all, you would expect a Rolls-Royce to be more expensive than a Ford Mondeo, but that does not mean the Rolls is worse value for money. The quality of the car could more than justify the higher price (although of course that is subjective). However, my stock screen allows me to be somewhat more objective than subjective in my assessment of value as it ranks companies based on a combination of their growth rate, growth quality and profitability, as well as their PE10 and PD10 ratios. PZ Cussons currently ranks at number 117 on the stock screen out of a total of 235 companies, which is almost exactly midway between 1 (the highest rank) and 235 (the lowest rank). As a result, at 270p PZ Cussons’ share price is, by this measure, almost exactly equal to fair value. That’s great, but I only want to invest in stocks that are trading some way below their fair value. If I do that then my expected returns are higher and I have a margin of safety in case I’m wrong. “Some way” below fair value means I’m only interested in the top 50 stocks on my stock screen. To reach that attractive level PZ Cussons’ share price would have to drop from today’s 270p down to something like 170p. 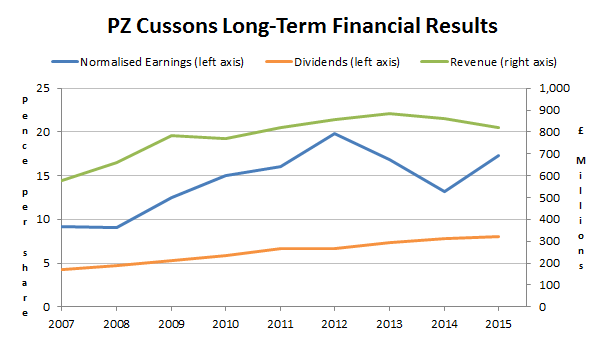 At 170p per share PZ Cussons would have a dividend yield of 4.6%, which is slightly better than the market average and would, if the dividend continued to grow at around 7%, give an expected return of around 11% to 12%. 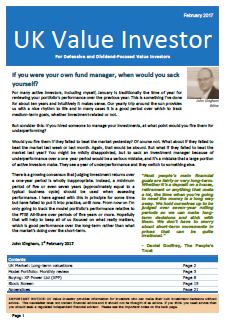 A yield north of 4% would also make the stock much more attractive to other investors which would, in turn, provide a stronger floor under the share price and an incentive for Mr Market to drive the share price back upwards. Of course, getting PZ Cussons’ share price to 170p, which is a 37% decline from where it stands today, would probably require some sort of bad news. Fears about the global economy, weakening emerging markets or even a profits warning; they’re all the same to me. As long as they’re not life threatening, can be reversed fairly quickly (and at little cost to the company) and don’t significantly dent its long-term value, then I’m happy to invest in the face of short-term problems. What I’m not willing to do though is invest at what appears, to me, to be an unexciting share price. So as is often the case, I will be waiting for PZ Cussons’ price to decline further before investing. John, Interesting review. Couple of points about PZ worth noting. If you compare it to Unilever, P&G or RB, it doesn’t have the world market reach of these competitors. It’s business is most prevalent in the UK, Europe, Indonesia, USA and particularly big in Nigeria. Two of the biggest risk factors are it’s currency exposure in Nigeria and Indonesia which, like many emerging markets (although I’d say Nigeria and Indonesia have already really emerged), they are exposed to US $ loans that are stretched due to falling currency values and the rising value of the $. Ultimately these things tend to level out and the US $ won’t stay up forever. That said, and despite your reservations and ranking, I’d say PZ is a good prospect and at current price levels it’s safer than a lot of other stocks that look like they are a bargain at lower multiples. There is also the innovative side of PZ which has done an excellent job of relaunching Carex and St Tropez is literally flying off the shelves and at £10 a bottle it’s profit margins are astonishing. Hi LR, you’re quite right; PZ isn’t quite as geographically diverse as its much larger cousins, but perhaps that just means it has much more room for growth. On Nigeria and Indonesia I cannot really comment. Exchange rates and politics are not really my area of expertise and so I rely on diversification to negate those sorts of risks. As for PZ being a good prospect, it could well be. I would expect it to continue to grow its dividend and so yes, it is a low-risk stock and at its current share price doesn’t seem to be overvalued. I would just prefer the price to be a bit lower and the yield a bit higher! John, your always on the look out for a bargain! !, ever thought of teaming up with Martin Lewis? I have a recollection that one of the little investment trusts has a decent chunk of its assets in PZ. Or am I imagining it? deary, not far wrong. M&G is one of the bigger investors, alongside Zochonis Charitable Trust who seem to be the largest investor. Couple of other points about PZC, it has operating margins of close to 14%, ROCE at 22% and the dividend of 3.4% is currently covered 2.2 times. There maybe more downside here, but my feeling is this will be in line with what the general market does. If you think the market is going to H in a handcart, then all bet’s are off, but at approaching 5500 I’m guessing the market’s yield of over 4% will be a reasonable prop. But then again there never has been any logic around short term movements of stock markets. Had a quick google but couldn’t see which one you might be referring to. I know that about 25% of PZ’s shares are held by trusts that relate to the founding family, but that’s not what you mean. 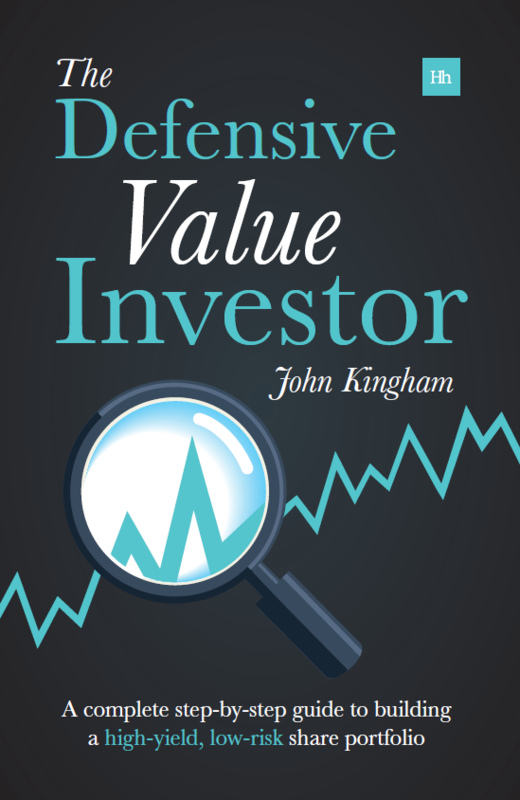 Hi TV, yes it’s definitely one for the defensive/income investor. As you say the price could drop if this bear market gets more aggressive, but then again everything else will drop too, so for me PZ needs to get that bit cheaper relative to everything else, not just in absolute terms.